This impressive riverside campus sits right next to one of the best stretches of coastline in the UK. It’s no surprise it has been named one of the top five campuses in the UK with the ‘wow‘ factor. It is home to the faculties of Business and Law, Applied Sciences, Education and Society and the Media department. Built in 1994 the riverside campus has certainly stood up to the test of time. The David Goldman Informatics Centre is an extraordinary space with over 500 computer workstations, which has been described as a ‘computing cathedral’. The David Puttnam Media Centre is home to subject areas such as journalism, PR, TV, video, radio and new media production, film studies and cultural studies. Students take advantage of industry standard equipment in 4,600m2 of studios, workshops and edit suites. 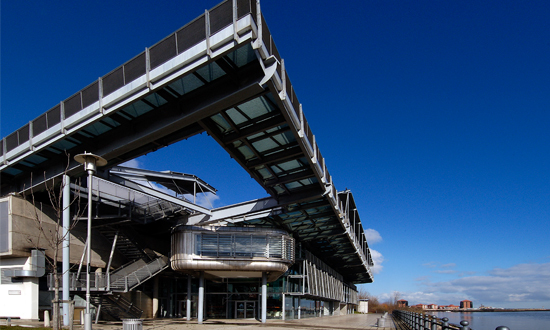 The riverside campus is now also home to the National Glass Centre, after the University took over the running of the building in 2010. The National Glass Centre is a centre of excellence in glass, architectural glass and ceramics. The university is one of the few universities in the UK teaching in this area. In May 2010, the University of Sunderland took over the running of National Glass Centre and in 2011 appointed a new director, James Bustard, with an impressive portfolio of work to his name, to progress the venue into the future. The first phase of the development of National Glass Centre focused on new accommodation for the University of Sunderland’s Art & Design Foundation programme on the lower ground floor of the building. The Hot Glass Studios have been brought together and reoriented, greatly improving the visitor experience of the live production of glass, as well as our teaching facilities. The Shop, which lies adjacent to the Hot Glass Studio, has been remodelled to create a better shopping environment and improved merchandising. Phase Two saw significant investment in the upper ground floor galleries. This phase doubled the exhibition and events capacity of the Centre, upgrading and modernising the gallery spaces, education and resource rooms and enabling the National Glass Centre to better meet the needs of the visitor, schools and groups.